Welcome back to Whimsical Wednesday! The day for your googled giggle that gets you over the hump that is Wednesday and sliding down into the weekend. joeh; it's excellent advice, (with a 'c'), although a few OCD people might not agree. Thank you for correcting my spelling, spell check does not when it is a real word. Just so you know, I am 71 years old and have been a terrible speller for 67 years, I am not liable to ever improve at this point so corrections will not help...kind of like pointing out a stutter to a stutterer or a limp to someone with a bad foot. It is not laziness, or stupidity, it is just a disability that I have never been able to correct. Yes, it is a pet peave of mine. Please don't be offended or insulted. The fault is mine, sometimes I just can't help myself. It is a scab I have that I hate when it is picked. I have a related post soon that addresses this, don't you be offended, I still think you are a very nice, bright lady and valued blog friend. Did you miss the misspelling of peeve? I suspect you just let it slide...LOL. fishducky; me too, although I haven't seen any episodes lately, I'll have to wait for the reruns. 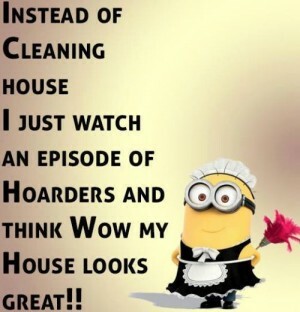 Jimmy; it sure does work, my clutter doesn't look half as bad after seeing one of those houses. only slightly confused; it does work, until I see one of those OCD shows where they scrub and bleach all day every day, but I've learned to ignore those a bit. Okay, a lot. I tell myself they're harming their health with all that bleach and anxiety. Yes, it is all relative. Andrew; about 99.9% of life is relative. You have to find what works for you personally and ignore people who tell you to do things their way. Elephant's Child; I have seen a house or two that would put a hoarder to shame, not so much in terms of clutter and amassed things, but the filth and stench. Lee; this is why my brand new vacuum cleaner is gathering dust. I might give it a run this weekend though. Under the bed where Lola has left half her fur. I also used to ask my kids about their friends' houses. "Is it as messy as ours?" I was secretly pleased when occasionally, one of them would answer, "Worse!" Val; I've never asked my kids that, but I did ask is it nice there? mostly regarding atmosphere, I wouldn't have wanted them going to friend's places if there was fighting or any other tenseness. LOVE it and think I will go check the schedule for the show's airtime. Really by comparison, my house is splendid. Arkansas Patti; it hasn't been on here in Australia for some time and it's usually on later at night, being not suitable for children I suppose.